Are you a fan of the charming and stylish Arvind Swami? If yes then we have some good news in store for you. In an exciting development, the first look poster of his latest big screen outing ‘Naragasooran’ has finally been released and it is quite intriguing. The poster features the names of Arvind and his co-stars. Moreover, it features some intriguing figures and designs. This kind of suggests that the film will be heavy on mystery and adventure. 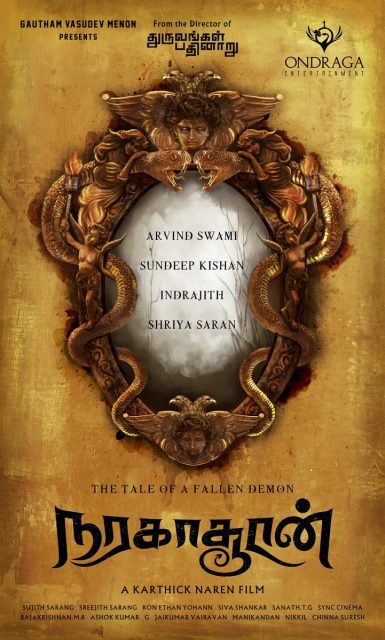 In case you didn’t you, ‘Naragasooran’ is being directed by Naren and is touted to be an intense drama. It features a rather cool tagline which reads ‘Tale of a fallen demon’. Besides Arvind, the film also features Sundeep Kishan, Shriya Saran and Indrajith Sukumaran in the lead. Interestingly, Sundeep’s role was originally offered to Telugu star Naga Chaitanya. However, he turned it down because of his packed schedule. “He explained that he is busy with other commitments. We are still in good terms and would love to collaborate in the future,” Naren added. \Well, it will be worth watching whether Naga Chaitanya’s loss turns out to be Sundeep’s gain. On a related note, Arvind was last seen in ‘Bogan’ which hit screens earlier this year. Touted to be a supernatural thriller and helmed by Lakshman, it also featured Jayam Ravi and Hansika Motwani in the lead. At present, besides ‘Naragasooran’, he also has ‘Bhaskar Oru Rascal’ in his kitty. It is a remake of the Mollywood film ‘Bhaskar The Rascal’.